Auto racing, both NASCAR and Formula 1, have reduced the time it takes to change tires and fuel the vehicle (NASCAR refuels, Formula 1 drivers are not allowed to refuel) from minutes to a matter of seconds. Here is a video that shows just how far they have come. 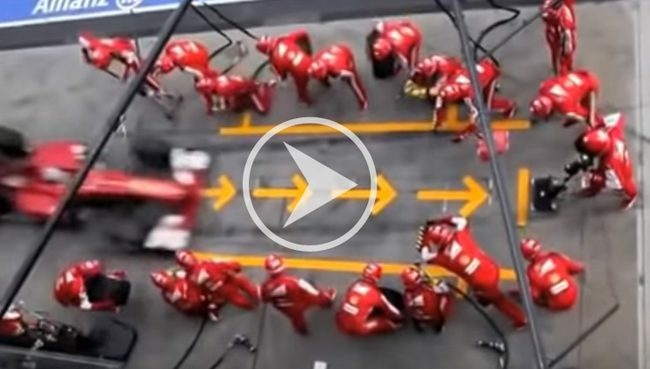 Check out the difference between a Formula 1 pit stop in 1950 and today. It is shocking! And, it begs the question, how much faster can your changeovers be? 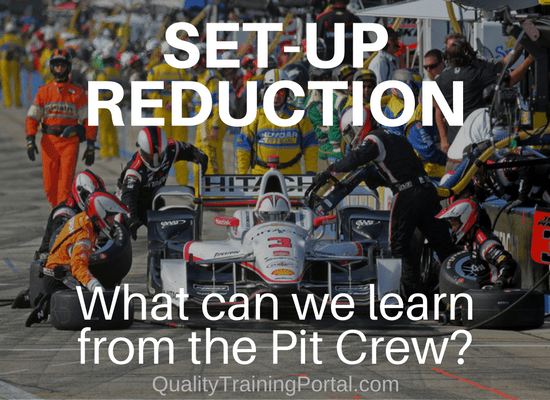 Compare today’s auto racing pit stop to how long it takes your average person to change just one tire and it is clear that there is plenty we can learn about quick changeover from the world of auto racing. The pit road, as it is called, wasn’t always so fast, but huge improvements were made in 1950s and 1960s. A pneumatic air gun enabled one tire to be changed in just under a minute – an eternity by today’s standards. When floor jacks replaced bumper jacks, another step-wise time reduction was made. Then, in the mid-1960s, pit crews started choreographing their “moves” to reduce motion and eliminate all non-critical steps. In the 1970s capless filler nozzles eliminated the need for gas caps that took time to unscrew and screw back on. In the 1980s lighter clothing, faster wrenches and improved fuel flow shaved off a few more seconds and in the 1990s race teams instituted “over-the-wall” practice for the pit crews during the week leading up to a race. Do you get a sense of where this story is going? Today pit crew members are trained as athletes. They have coaches, fitness and training facilities, high performance clothing, video reviews and they practice, practice, practice. The result is a typical pit stop of 12 seconds on the NASCAR circuit. Pit stop time is often cited as a key factor in race performance. While your organization isn’t racing head-to-head against your competition, when it comes to equipment changeovers, consistently quick turnovers can have a big impact on production schedules, equipment costs and your bottom line. If your equipment isn’t running, it isn’t making you money. Have everything needed for the changeover ready BEFORE the equipment stops running. Gather all of the parts, tools and equipment needed in anticipation of the equipment downtime. Track changeover time – if you don’t measure it, you can’t improve it! Timing starts when the last good piece is made on the old set-up and ends when the first good piece is produced on the new set-up. Have changeover procedures documented and practice them when someone new joins the changeover team. Also document the changeover “kit” including parts, tools, equipment and materials that need to be assembled in advance. Make it easy! Use quick disconnects, make it impossible to install things incorrectly, put heavy equipment and tools on rolling tables that can easily be moved in and out of the area. Pull in extra resources to work on the changeover. This enables people to specialize in certain changeover tasks so that several parallel activities can be going on at the same time.